This page keeps you informed on the progress of getting this third book of my highly accurate and successful Trump prophecies now scheduled for release early in 2019. 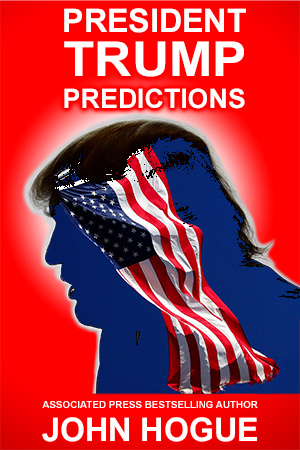 My first book, Trump for President: Astrological Predictions was written in September-October of 2015 presenting a real-shot alternative future accurately foretelling how Trump could pull off an upset victory against Hillary Clinton and much more. Back then it already set the foundation for what a Trump as president of the United States might do. Next came my book on Trump’s 180-degree foreign and military policy mood shifts, entitled Trump Strikes Syria: and North Korea? It was written in April 2017. The current crisis coming to the brink of war over Korea and the oncoming collision in Syria between Russian backed “vassals” clashing with US backed Kurdish “vassals” surrounding and defeating ISIS makes what I wrote in April sound like it was written today–including the peace breakthrough potentials. I hope you’ll read both these Trump books while I’m completing the climactic third and final epic. Click on the cover and read a book written in April 2017 that reads like it was written today about Syria and North Korean flashpoints possibly causing a nuclear weapons crisis. I had to stop work on that third book in April to write the Syrian/Korean tome. I haven’t been able to return to it until other books already in the waiting list are finished first. That means I resume final work shortly after New Years 2019 and hope to have it released before the spring solstice in March. This book builds upon the themes of the other two as its foundation. It will especially focus on the all-important times to come following the pivotal 2018 Midterm Elections. After the most challenging first two years in office awaiting our 45st president does President Trump have a future? Will he finish his first term and be elected for a second? Will Democratic witch hunts, scandals or a more shadowy denizens in the Washington Swamp take him down? Or not! Like the others it is a rare fair and balanced overview about the President. It is a book I want him to read as well as anyone else. A book that will not pull punches but not deny the positive potentials and the responsibility that the American people on both sides need to take up as a challenge to be better communicators using love–not reaction and hate–to help this “open channeling” president be a medium for what is good for the country. GET ON THE LIST FOR A PERSONAL PUBLISHING ANNOUNCEMENT! Just Contact Me at this link, put only one word in the email subject line: Trump. I will give you updates on the progress of completing it. If you’ve already asked to be on the list long ago, don’t worry. You are still on the list. No need to repeat request. I’ll make sure you’re informed when this book is available as an eBook and Printed Book. CHECK OUT THE EVOLVING TABLE OF CONTENTS! Oh Say Can You “Idiocracy” See? TrumpCare: Is the “Price” Right?